On 11 February 1858, Bernadette Soubirous (aged 14) was gathering wood near the grotto of Massabielle (Lourdes) when she had a vision of a lady dressed in white standing in a hollow in the rock. It was the Immaculate Conception. She went on to see this vision a further 17 times, before ever-increasing crowds, until the day of 16 July 1858 when the Virgin asked for repentance in her name and a sanctuary to be created in her honour. Guided by the hand of the Virgin, Bernadette discovered a spring at this spot. Subsequently, the pilgrims started reporting cures and a medical office was set up in 1882. The findings of the doctors are sent to the diocesan authorities, which decide whether there are grounds for a miracle or not. Lourdes, located in a region with a rich natural heritage, is much more than a pilgrimage destination. It offers a wide range of opportunities for spa treatments. For sports lovers in winter the ski slopes are only 40 minutes away, and in the summer, if you fancy paragliding, rafting, fishing and other excursions, you are spoilt for choice. The Pic du Midi de Bigorre is a superb destination for high mountain tourism for holidays and weekends: family outings, tourist excursions, school trips, business events and seminars. All year round, you can take the cable car from La Mongie, at the foot of the Col du Tourmalet. At the summit: the finest views of the Pyrenees, a museum of astronomy and history of the Pic du Midi and a traditional mountain restaurant. Return by ski or by mountain bike. 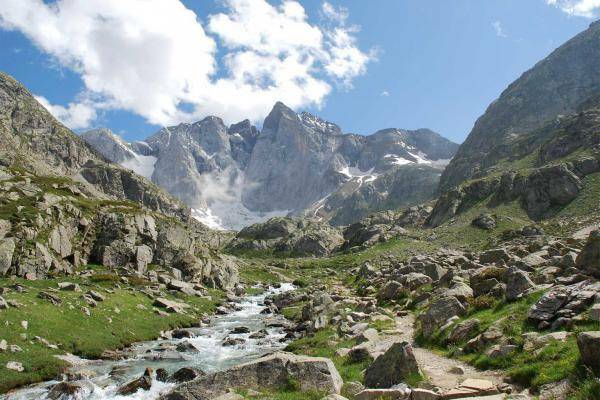 If you stay in the village of Gavarnie you will be able to explore this area of the Parc des Pyrénées, with the cirques of Estaube and Troumouse, the lush green Vallée d’Oussoue, and the magnificent ‘Brèche de Roland’, a mountain gateway to Spain. In winter, Gavarnie is a family ski resort where you can do downhill skiing or cross-country skiing in the heart of and around the edge of the cirque. The Grottes de Bétharram rank amongst the finest grottos in the world and are definitely the most interesting to visit because of the large variety of formations. Their natural beauty allows the visitor to understand the development of almost inactive and active grottos. They contain 5 separate storeys like those of a house, each hollowed out during a different era. In Cauterets you will find a village dedicated to sport, where you can experience thrills in all those sports that involve sliding or gliding, with health spas, and thoroughly modern sports and leisure facilities. A very special spot in the High Pyrenees and the perfect antidote to boredom. Discover the Moontanya association to practice nature activities.